"Vigilant Hawks" is available as a signed limited edition lithograph. Germany. 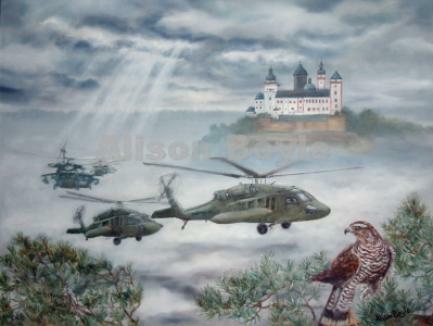 As the flight of war birds pass, they are watched by the vigilant eyes of a Goshawk in an overwatch position. Like the Blackhawk helicopter, the Goshawk is native to the United States and also legendary for its amazing flight skills.